Step onto the red carpet and start celebrating like the stars. It is time to host a Hollywood party in the theme of awards nights. The stars will be out tonight wearing their black and gold party accessories while walking on a red carpet aisle runner. Turn on the spotlights and roll out the red carpet it is time for a one of a kind awards night party in the heart of downtown Hollywood. You might not be throwing your party in Hollywood, however, by the time you get done decorating with our bulk awards night decorations. 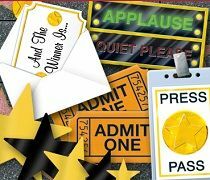 It does not matter if you are hosting a small group of people, or hosting a big party to celebrate the Academy Awards, Party Express has the Hollywood theme party tableware, Hollywood party decorations, and Awards night favors to make your event a party that no one will be able to forget. Let everyone know that you are having a party with Hollywood party banners and hanging decorations. Roll out the red carpet to welcome guests to make it look like they are on the Hollywood walk of fame. Hollywood party favors, Awards night confetti, and red rope stanchion sets are just some of the ways that you can make your party look like Hollywood. So select your bulk Hollywood party supplies and save, not to mention you will look great doing it! 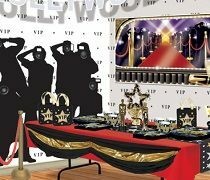 Party Express has all of the favors to make your Hollywood party as authentic as can be. We have directors clap boards, statues that look like you just won a major movie award, wall signs that look like movie tickets, and dozens of costume accessories that will make your guests look like they just came out of a world class movie premier.